Elon Musk appears to be just as keen to bring Tesla to India as his many Indian fans. Musk has said that Tesla is in talks with the Indian government to bring their electric vehicles to India. “(Tesla is) In discussions with the government of India requesting temporary relief on import penalties/restrictions until a local factory is built,” Musk replied to an Indian Twitter user. Musk and the Indian government have been having a bit of a back and forth on Twitter over the last few weeks. Last month, Musk had dashed the hopes of Indian fans who’d been expecting a Tesla launch in 2017 or 2018, by appearing uncertain about the import regulations in India. Musk had said that 30% of Tesla’s parts must be locally sourced for it to come to India — India, of course, doesn’t yet produce parts that Tesla could use. Maybe I'm misinformed, but I was told that 30% of parts must be locally sourced and the supply doesn't yet exist in India to support that. But in a testament to Musk’s growing profile, or the government of India’s responsiveness, the official Make In India handle had clarified the situation the very next day. The Indian government said that Tesla is free to bring its cars to India — provided it did so wholesale. The 30% restriction only applies if it retails its cars, as it does in the US. Of course, if it set up manufacturing facilities in India, it would be able to sell its cars as it wishes. Cars which are imported from abroad are subject to high import duties in India, which mark up their price by 100-120%. These duties would make Teslas prohibitively expensive, Musk’s latest tweet seems to indicate that Tesla is looking for temporary relief on these import penalties. In return, Tesla seems to promise that it’ll build its factories in India and start manufacturing within the country. 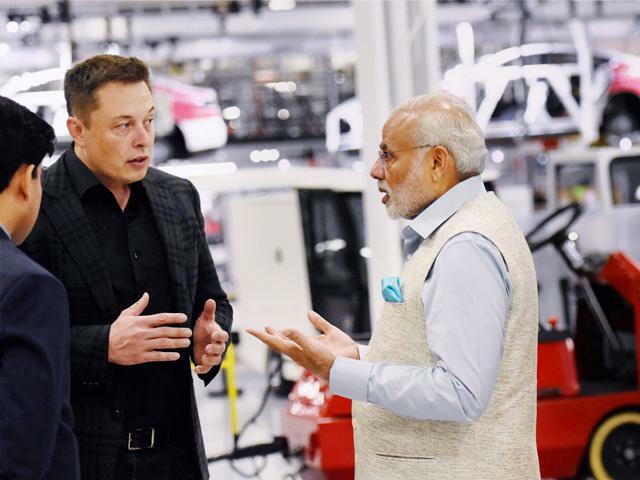 There has been talk for a while about Tesla building its factories in India — when Prime Minster Modi had visited the US last year, he’d met Musk at one of his factories, and invited him to build them in India. After his return, Union Minister Nitin Gadkari had also offered land to Tesla to built its factories in the country. Tesla’s India entry would be a win-win for both parties. Tesla would become the feather in the cap of the Make In India initiative, and its factories would provide jobs to thousands of Indians. Tesla also ties in neatly with the Modi government’s push towards sustainable energy. Tesla, of course, would have access to a billion Indians who could potentially buy its cars. And Tesla wouldn’t want to miss out on a market as large as India. India’s electric car space is already heating up, with Mahindra tying up with Ola to run India’s first all-electric fleet in Nagpur. Anand Mahindra has cheekily invited Musk to quickly come to India, or risk losing the market to his own company. And knowing Musk, he isn’t one to back down from a challenge.